Most of the time when I rescue a cat out of a tree, there is someone there who will take responsibility for the cat once I get it down. Usually it is the cat owner, but sometimes it is someone else who is going to be responsible for the cat. 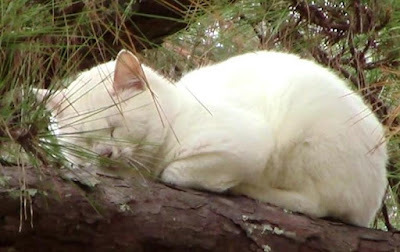 Sometimes, however, no one knows the cat or its owner, the cat is not micro-chipped, and there is no one there who is able to care for the cat. These cases are problematic for me. I can't care for every one of these cats myself, so my options are very limited. 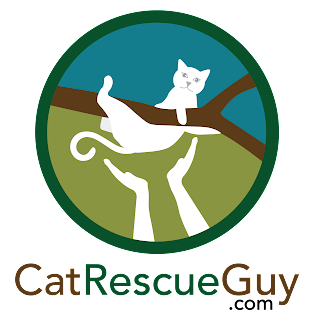 One option is to release the cat there immediately after the rescue. If the cat is ear-tipped and, therefore, known to be sterile, releasing him is the best thing to do. That is less stressful for him and allows him to resume his normal life, whatever that may be, as soon as possible. If he is being cared for close by, he can then return to his home. 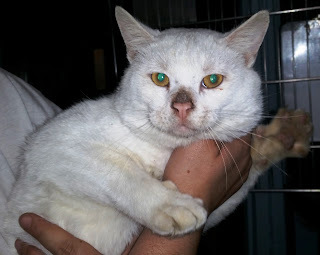 But if I don't know if the cat is sterile or not, then I think my best option is to turn him over to our local animal shelter, Companion Animal Alliance (CAA), where he will be spayed or neutered, vaccinated and then returned to the same location. It's very stressful for the cat, but at least we guarantee that he will not be producing any more kittens, and he will be enjoying the benefits of his vaccines. After it is all over, at least he will be better off than he was before I rescued him. Such is the case with the unknown cat I am calling Pride, a name I am taking from part of the name of the street where I rescued her. I never got a clear look to determine if Pride is a boy or girl, but I think it's a girl. She is solid white and pretty. I do not know about her disposition, because most cats, even many friendly ones, get scared when I try to rescue them in a tree, and they behave defensively or even aggressively. She was scared of me and climbed higher in the tree to get away from me. She was also very stressed to be put into a carrier afterward, so I did not see her best side. I suspect that she is at least a little tame, because she would have been much more difficult to handle otherwise. When I arrived, I found her about 20 feet high in a pine tree not far from the highway. She was crying in distress, and I take that as a sign of a tame cat. But I also noted how her cries changed once she saw the activity taking place on the ground below her. When I installed my rope in the tree, it frightened her enough that she climbed to 50 feet and walked out to the end of a long branch. I was somewhat relieved to see her walk out on the branch, because then I could climb up to that point and keep her from climbing any higher. On the other hand, I knew I would have difficulty reaching her that far out on the limb. When I climbed up to her branch, she was clearly unhappy with my presence and was not going to be cooperative. In spite of that, I wanted to offer her some food just in case she was capable of a change of heart. At the very least, it would show her that I as at least somewhat friendly. I extended the food as far out on a pole as I could reach, but this only brought her more distress. She calmed down only when I retrieved the food. My only option was to use the rescue pole, and I wasn't sure if I could reach her even with the pole fully extended to 12 feet. I walked out on the limb as far as I could safely go and was just barely able to reach her with the pole. As she stepped even farther away onto the feathery tips of the branch, I became very concerned about her falling. Fortunately, Alicia, the girl who originally called me, and her friend held out a blanket below to catch her if she fell. I reached out as far as I could possibly reach, and was able to swing the noose of the pole around her head. Now I just had to get it under her front feet. I pulled slightly to get her to move back toward me and lift her legs through the noose. When she did so, I tightened the noose. As I did so, she continued to move through it, and the noose slipped over her back end instead. I released the noose and let her out of it to start all over again. As she repositioned, she suddenly slipped her back legs off the branch and was dangling by her front legs alone. She hung there for a moment and then successfully pulled herself back up on top of the branch. That was a close call. Again I worked to place the noose around her head and then slip it under her front legs. This time, I was able to tighten the noose in the proper position behind her front legs. I gently, but firmly, pulled her along the branch toward me. She clung to the branch tenaciously, but did not cry or fight. When I got her close enough to me, I picked her up off the branch and shoved her into the net. I released the noose and secured her in the net. At last, I finally had this girl safe and secure. I brought her down to the ground and scanned her for a micro-chip. Not surprisingly, she did not have one. I then transferred her carefully into a carrier after first placing a bowl of food inside. She was too distressed to care about the food, but it was there if she should calm down. Since she did not have a micro-chip, my only option was to take her to CAA. But it was getting late, and I had a long drive to get there before they closed. I quickly packed up and left and arrived at CAA just 10 minutes before they closed. They will care for her and check her out. They will spay and vaccinate her, and the next day they will return her to the same location. I just hope she doesn't run up a tree. There is no video of the rescue, because I forgot to bring the camera. I was halfway up the tree when I remembered it, but did not feel like going back down to get it. Sorry. I went to CAA to check on this girl, and it turns out she is a he. He is also not neutered. But more importantly, he is a sweetie. He is very friendly and let me pet him. He pushed his face into my hand to invite me to pet him more. The caretaker held him while I took this picture, and he melted in her arms. It is not clear how long he will be there, but CAA will keep him at least a few more days, possibly much longer. If someone pre-adopts him, they will neuter and vaccinate him and turn him over to you for only $5. That is a steal of a bargain. 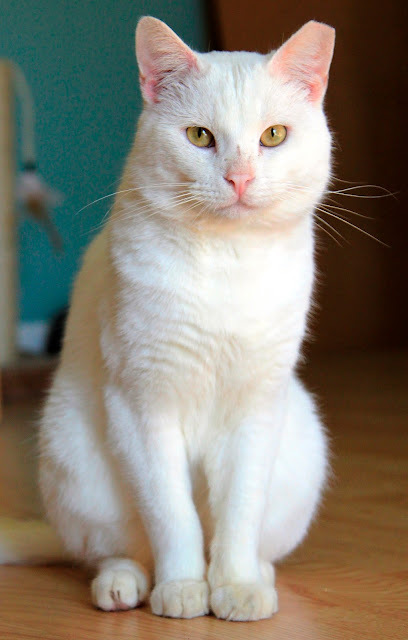 Judging by the amount of interest I have seen in this cat, I expect him to be adopted very soon. I certainly hope so. He deserves a good home. Much has happened to Pride since the last update. While he was at CAA, he was neutered (and consequently ear-tipped) and vaccinated and was going to be returned to his original location until I intervened. I brought him home with me to foster until I could figure out what to do with him. I took him to my vet where he was treated for worms, fleas/parasites, an upper respiratory infection, tested for FeLV and FIV (both negative) and given an overall exam. After almost three weeks with me, he is now recovered from all his ailments and is healthy and beautiful. Because he is so soft and white like bread dough, I have re-named him Biscuit. Today, I took him to Cat Haven where he will be kept until he can be adopted. Judging from the interest I have seen in him, he should not be at Cat Haven long. He is quite a lap cat and a gentle, affectionate boy. He would make an excellent pet and deserves a loving home. Update -- 1/25/2017Today I learned that Biscuit has been adopted. He was adopted along with one of his roommates at Cat Haven on Sunday, the 22nd. He was in Cat Haven for just over 2 weeks and got along well with the other cats. While I am very happy that he now has a good, permanent home, another part of me is very sad that I missed my chance to adopt him myself. He is quite a guy, and I wish him and his new family all the best.